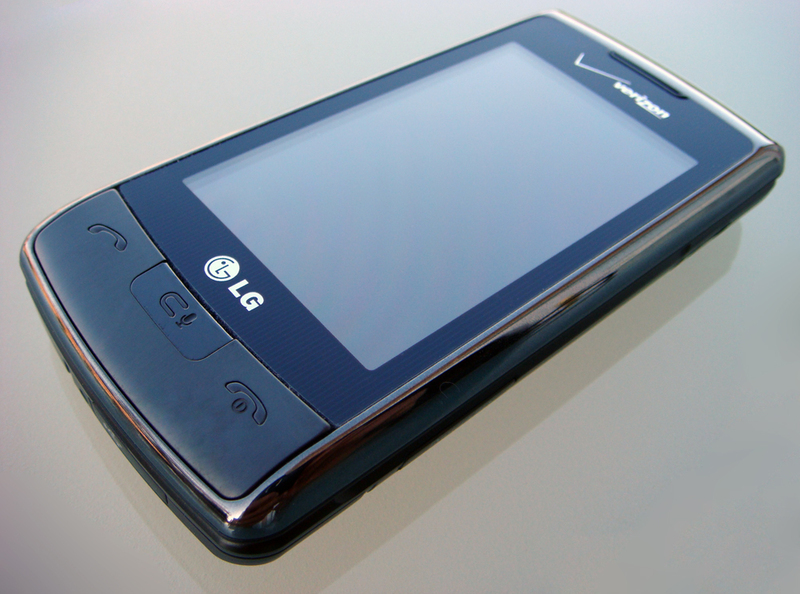 Bringing back the “enV” name, the LG enV Touch (VX-11000) is the upgrade to the popular LG Voyager (VX-10000), which was released in late 2007. The phone keeps the same form factor as its predecessor, but is now slimmer and more stylish. The enV Touch has many new features, normally found in more expensive devices, such as video editing and a office document viewer. There is no doubt that the enV Touch is a large phone; 4.5 inches tall, 2 inches wide, and over a half inch thick. Despite being a tad bit too large, it actually looks a whole lot more attractive than the Voyager and the Dare. The back of the phone features a soft rubberized texture with a unique engraved pattern which offers a decent grip. The left side has the camera trigger, volume toggle, and the display lock button. 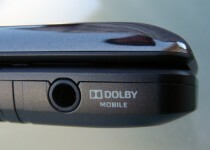 A 3.5mm headphone jack and a microSD slot can be found on the right side. On the bottom you’ll find the microUSB connector which serves two purposes: charging and data transfer. The face of the phone has a large 3-inch touch screen and three “brushed metal”-looking physical buttons at the bottom: send, clear, and end. The clear key seconds as the voice command button when on the home page and initiates voice memo recordings when held down. When you flip open the phone you are introduced to another 3-inch display, stereo speakers, a full QWERTY keyboard, and a navigation D-pad. Compared to the Voyager, the keyboard now has larger keys and remains well spaced at the same time. 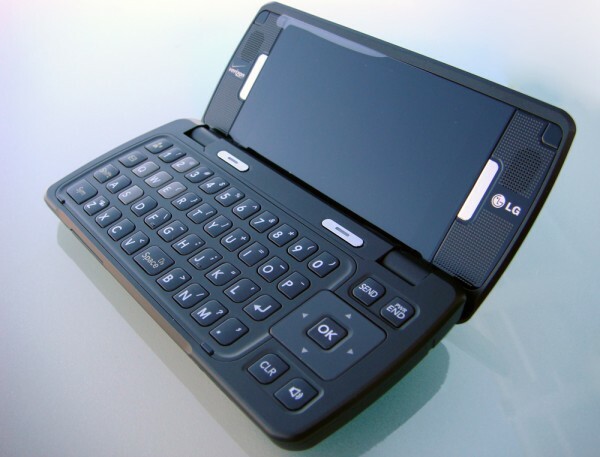 LG has finally placed repositioned the “space bar” to the center of the keyboard instead of two “space bars” on the bottom left and right as they were on the LG Voyager, LG enV2, and LG enV. Overall, though the enV Touch isn’t the most compact phones I’ve had for what it offers, but remains functional and isn’t too large to fit into an average sized pocket or purse. We were quite impressed with the resolution and the colors of the displays. 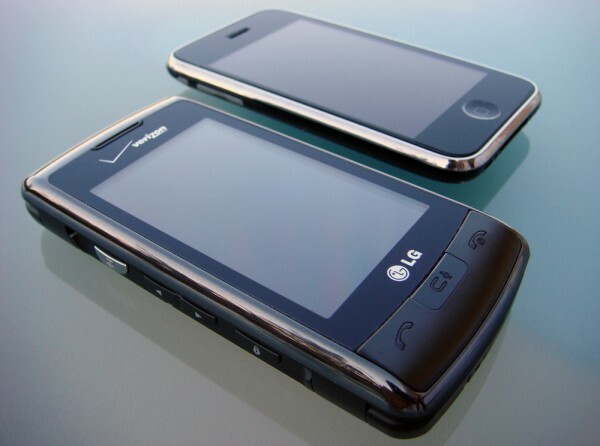 The enV Touch’s 800 x 480 pixel display has a higher resolution than the iPhone’s 480 x 320 pixel screen. Both photos and videos look great on both screens. The external display also uses a sensor that dims out the screen as you hold it up to your ear, but I found this to be sometimes problematic since it often didn’t turn back on if I were to try to use the interface during a call. The only way I managed to get the screen working again was to either flip open the phone or by placing my finger over the sensor for a second and then moving it away. Other than that small annoyance, the displays are bright, sharp, and even looks decent outdoors. The enV Touch has a similar interface to the Voyager and like its predecessor, duplicates features on the external and internal display. However, not all features on the external work from the internal, and vice versa. For example, photo editing only functions on the external touch screen. To unlock the phone you must slide up an overlay on the screen or press the lock/unlock button on the side of the phone. The home screen has 5 permanent icons on the bottom: messaging, dialpad, menu, phonebook, and favorites. The favorites menu allows you to set 10 favorite contacts for quick access. In addition 3 “widgets” can be placed anywhere the main page; memo, calendar, and clock. The memo is very similar to a sticky note on a Macs. On the right side of the home screen there is an arrow which links to the shortcut menu, which manages all application/utility shortcuts. Mostly any tool on the phone can be placed in the shortcut menu or can also be placed as an icon on the homepage. The interface on the internal display has a more traditional interface, familiar to that most Verizon Wireless phones. The D-pad can be customized to launch various applications when on the home screen. One major problems I ran into occurred when an application on the internal display then closing the phone would exit out of the application and return to the home screen instead of moving to the outer display. Overall, the interface is very intuitive and for the most part it works seamlessly between the two displays. After many iterations of the enV lineup, LG has mastered the messaging feature of this phone. The physical keyboard does not need much of an explanation, it works as it should and feels great. The external display also supports messaging, with support for both a portrait and landscape virtual keyboard. The virtual portrait keyboard does the job just fine for quick responses, but is a bit impractical for typing long messages. The horizontal virtual keyboard works a whole lot better than the portrait and is a viable option. The interface enlarges the letters you hit as they are typed and provide haptic feedback as well. The size of each virtual key and spacing helps the usability experience as well, however the internal physical QWERTY keyboard is by far the best solution for messaging. The enV Touch has an extremely feature packed camera and camcorder interface not found on other phones. The 3.2 megapixel camera can take photos up in various resolutions up to 2048×1536. It features an unusually bright LED flash, which can automatically turn on in low-light situations. The camera uses the auto-focus setting by default, but can be switched to macro for close-up images as well as a manual focus option. The camera has white balance, brightness, color effects, and self timer settings. In addition to these settings the camera has a couple of “goodies” that you will not see in the typical phone camera. One would be the panorama mode, where the phone will actually guide you through the process of snapping a panoramic photo with on screen instructions and then stitching them together. Another would be the smile detection, where the camera will only snap the photo only once the subject smiles to get the best picture. My favorite by far was the NameCard reader, which lets you snap an image of a physical business card and it uses OCR to extract the name, email, and phone number into your contacts. A built in image editor allows cropping, draw on the image, and adjusting the brightness of the photo. The camcorder can record clips with a max resolution of 640×480 and offers custom white balance, brightness, and color effects. 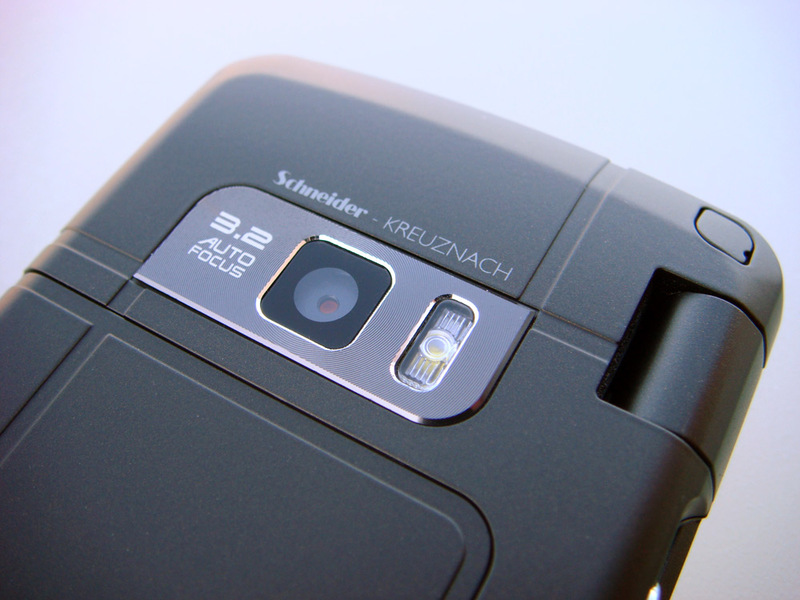 Most phone’s camcorder functions are rendered useless in the dark, but not the enV Touch. The camcorder can switch on the LED flash during a recording which turned out to help a lot. Finally, the enV Touch does a great job with video editing. One of the much hyped feature on iPhone 3GS was video trimming and this plus much more can be done on the enV Touch. The trim feature allows a simple crop, after choosing a start and end point. But say you wanted to cut together multiple parts of a video, that’s where the multi-trim feature comes in. You can cut together up to 3 different parts of a video (3 different start and end points) and the phone will merge these different parts together into one video. The camera in the enV Touch really stands out because of the depth of options presented and puts it clearly ahead of many other phones in the U.S. Market. The enV Touch was designed to work as a full time mp3 player with a set of internal stereo speakers and a 3.5mm headphone jack. The music player is organized by Artists, Genres, and Albums. It can also display album artwork which looks good in its sincere imitation of “cover flow”. The player can create on-the-go playlists and manage music storage between the microSD card and internal memory. Music playback supports shuffle and repeat modes. For listening options, the Dolby settings allows you to toggle between preset equalizers, such as bass booster and classical. Audio playback on the speakers was clear with no crackle, even when turned up all the way. One of the features I liked the most was that music application can run in the background. Performing other tasks such as look up a contact or texting is possible without having to exit the music player. I decided to use my enV Touch when I went for a jog. I found it extremely difficult to use the external display to navigate through songs. In addition to the poor visibility due to sunlight, it was difficult to even manage to click the next button or pause my music. Some external controls for music would have gone a long way. Overall the music player felt solid, keeps getting better, and usable but not polished, it needs to be put back in the oven for a bit longer. 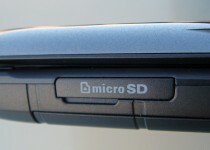 The enV Touch uses a standard microUSB port to connect to a computer. It can be used in data mode, which shows up as an USB Mass Storage Device on a computer and allows you to manually transfer photos, documents, and music to the microSD card. The other option is to use the phone in music mode, in which it can be synced with the Verizon V Cast Music with Rhapsody program or with Windows Media Player as an MP3 player. The charger is also modular, the AC adapter is actually a USB charger. The same cable needs to be disconnected and is used to sync with your computer. One small quirk I noticed was the fact that the phone significantly heated up while charging. It wasn’t too hot that I’d be concerned about the phone getting damaged, however constant heat isn’t good for batteries, meaning a reduced lifespan. The phone offers many other features including the now standard world clock, tip calculator, and alarm clock. The one feature that stood out the most was the document viewer, an application not usually found on a non-smartphone. The viewer can read, .doc, .docx, .xls, .xslx, .ppt, .pptx, .pdf, and .txt files. The documents loaded fairly quickly and were fairly readable once zoomed in. I found using the Document Viewer more pleasurable than the iPhone. Mainly since I could simply copy them straight over to the phone’s storage or microSD, rather than having to email them to myself as you have to do on the iPhone. After using the enV touch for a few weeks, it has left us with a very good impression. I would say as of now, it is the best non-smartphone on the Verizon Wireless network. It has an amazing display, two displays to be correct, and excellent media features. It supports a full HTML web-browser, VZ Navigator, V-Cast videos, voice commands, and text to speech. If you are looking for a new phone and just can’t justify paying those required high rates for data plans associated with smartphones, the enV Touch is a no brainier. It has a solid set of features that just about everyone from a casual consumer to a tech-junkie can appreciate. It is available online and in Verizon Wireless stores now for $150 for new customers. Existing customers eligible for upgrade should be able to knock off about $50 to $100 based of the type of calling plan they currently have. I’m considering getting the Touch and your comments are very helpful. A question I have concerns the MP3 storage and playback. Can I use the Touch to store and listen to recorded books and podcasts using these features? of course! if the audiobook files are one of the formats supported by the phone yes! however if it is one of those DRM enabled files that states it only works with specific devices, you might have a bit of trouble! Yes, the Touch will play recorded books and podcasts, however, it cannot remember your place in either an audio book or podcast, it treats them as it would any other music file. I just bought the enV touch today and I’ve been playing with all of the features. When I took a picture, I noticed that, unlike most phones, the front screen does not show what you’re taking a picture of. Usually, there is a button to press to turn this setting on, but I’ve searched and searched and I cannot find it. Does this button exist on this phone? Yea it does. I have the env touch. And it does. But sometimes the phone glitches up and so it doesnt appear. But yea usually here is a button for that. Well don’t keep us waiting…what is the glitch?? Help me, Im going crazy..
1) When you charge by the USB charger to the USB hub/port OR charge it by the USB charger with A/C adapter, I see that the phone heats up a little, therefore, that might deplete the physical battery power. 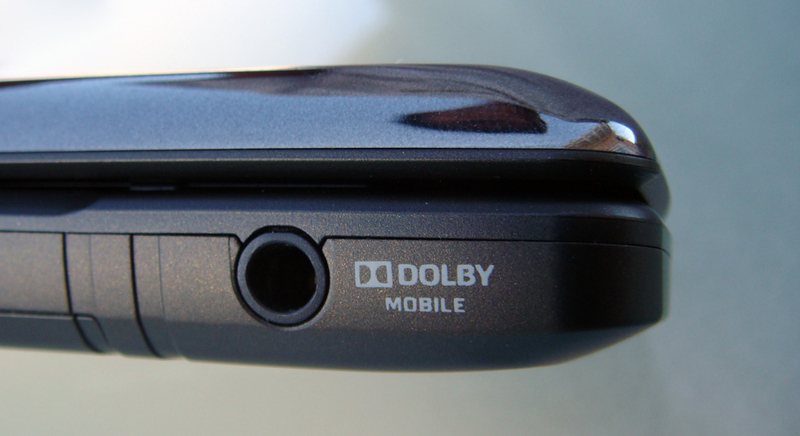 2) Call quality: When you adjust the phone (not during a call), I can hear it very well. BUT… when you are IN a call (conversation), you cannot adjust the volume setting; that also makes the sound even quieter than the LG Voyager itself, where you can adjust the volume WHILE in a call. What gives? How do I adjust the volume setting WHILE in a call on the ET (EnV Touch, for short)? Suggestions? Tips? Feedback is welcome! Thank you! I could be wrong, but I assumed you just use the volume up/down rocker on the left side of the phone to increase or decrease volume when in a call! Let us know if that doesn’t work. Hi. I just did that.. for some odd reason, it says that “TTY MODE UNAVAILBLE” while turning the volume “rocker” up or down. Hmm… maybe I need to change the TTY mode setting. See if that helps. Respond back if so. Thank you! Yep… I found the reason why it was so low while in a call: It was the TTY mode setting… that was very odd! Thank you very much though! I have had the phone a couple of weeks now and really like it. The large screen is great. But I don’t like the announcement of each menu selection I make. Is there a way to turn this off? Thanks. yes, the menu readout option should not have been on by default, but to turn it off go to settings –> phone settings –> voice commands –> prompt mode, and select “Prompts” ,that should turn off the readout on each menu. So i’m thinking about upgrading to the env touch. I’ve gotten really into twitter lately and was wondering if you can take pictures with the phone and post them on your twitter. I know you can with a blackberry and with the iphone I just don’t know about the touch. If anyone knows the answer that’d be great. Thanks! im thinking about getting the env touch just wondering what other colors then black do they come in??? Since the LG EnV Touch is an almost brand-new phone for Verizon Wireless, the only color option is the black color… same way that the LG Voyager did when it first came out in the 4th Qtr. of 2007. Maybe it will come with different color flavors in the future… but don’t count on that UNLESS they really do in the future. You just need to do a touch screen collaboration on the phone. It should be somewhere in the settings. I just put a 2gb microSD card in my LG Env Touch. How do I get my pictures to store on the card, instead of on the phone? It’s actually quite easy. Just head over to the Settings. Then go to the Memory section. There should be something called “Save Options.” In there you can choose where you want photos and videos to be saved! Hope that helps! I put a 4 GB card in my phone, but can’t figure out how to get the photos ALREADY stored on the phone memory to transfer to the microSD. Is there a way to do that? Just got the answer to my own question. After installing the card in the phone you can go to Settings & Tools>Memory>Phone Memory>My Pictures. There, you will find the option “Move Picture.” You can mark all and hit “Done” and the phone will move all your files from the phone memory to the SD Micro. Now I can pull that card out, put it in the adapter and put it in the card reader USB and put them on my computer. The phone takes great photos, but I was really annoyed that they would only send in a downsized mode via text. Thank you so much. I just got this phone, so I may be back with more questions. I’m having a lot of trouble trying to sync my EnV Touch’s calendar with my computer. The app LG sells has not worked. After going to an LG forum, I learned that others have experienced this glitch. Someone in the forum recommended synccell.com which has an app but it seems to work only for PCs. Is there a solution for a mac user? in all honesty, that calendar is pretty crappy. it’s proprietary so its not going to be easy to find applications to work with it. there might be some apps in the VCAST store to help sync with stuff such as google calendar. however most people don’t use phones such as that as a smart phone. But yes I agree it should be much easier and more open! Margaret, give Bitpim a try. The newest test release supports the enV Touch, and will allow you to sync the Calendar, along with phonebook, wallpapers, and ringtones. Thanks to Bitpim, I’ve never bought a ringtone from Verizon. :) I’m not sure if the Mac version has enV Touch support yet, but it’s worth a shot. I am in great need of the ability to sync my calendar to Google’s calendar. I cannot justify the cost of the smart phone. Got my EnV touch at a screaming deal when i purchased the new service. Does anyone have any further info on VCAST or other places to pick up an apps to do so? It would be greatly appreciated!!!!! I want an env touch but i want to know some things about it will somebody tell me about it cause in 10 days im up for an upgrade so thanks Please comment! Hey Kyleigh… as far as I know, I’ve owned the LG EnV Touch for over a month… this is by far the MOST and fabulous phone I’ve ever owned! Sure, it lacks the option of subscribing to Mobile TV like the LG Voyager did, but hey.. it FINALLY has autofocus feature WITH the LED flash.. that helped a lot especially in low-light conditions. The thing is… even though it has 1.5 video zooming option (or picture zooming at 1.5x? ), that wasn’t the most impressive option because the Voyager had 4x the zooming feature (pictures or videos)…. but all in all, the LG EnV Touch is, by far, the excellent choice when purchasing that phone! You can also download videos, pictures, music, and other files (And in PDF format too! Also Microsoft Office 2003 and 2007 files).. and so on. I’ve had the phone for almost a week (used to have a Dare). Does anyone know if there’s a limit to how large an SD card I can use? Also, I’m using the T9 setting and it doesn’t seem to be saving words I’ve used in the internal dictionary thing – I keep having to manually correct them. Is there a way to make it save words? I believe 16GB miroSD is the max. Thanks. Is the internal memory on this phone less than the Dare or am I imagining it? What’s the word on the EnV3? * = I’ve heard rumors that the barrier could “break” and could have a maximum of 32 GB or 64 GB of external MicroSD memory… I really don’t know about this part. ** = as a reference for those who have their own phones as partially described in line 2. Hmm.. maybe it was just a glitch. I was on there checking my bank account and in the middle of transferring some money, it stopped and said there wasn’t enough memory to load the page – then it shut off. I turned it back on and tried again and it was fine. I forgot to mention a couple of things: First of all, when I said “line 2”, a reader would think the 2nd line in the 1st paragraph… I meant to say “Line 2 as in reading the “LG EnV 2” part). The other thing I should note is that the part where I put the **… well, I think I read it somewhere in a forum at http://www.env-touch.com. The other vaild (forum) website is http://www.voyager-lg.com. The forum is mainly for people who needs more info. or needs some help on both the LG EnV Touch (EnV T.) and LG Voyager, respectively.